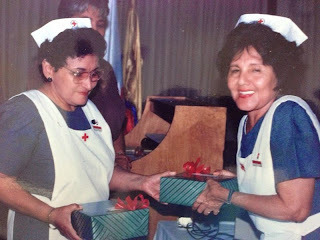 Margarita Sandoval (on the right,) my grandma, when she was a gray lady for the Colombian Red Cross. When I think about Margarita Sandoval, my grandma or “abuela,” I think about a proud, strong woman. She was born in Colombia, in a small village called Oiba. When she was 52 years old, with no education, my grandma was inspired to help others by volunteering with the Colombian Red Cross; and she’s now inspired me to work with the American Red Cross as well. Sadly, my grandma was forced to marry young, at 15, dropping out of school to do so. She had six children with my grandpa; the oldest was my mother, Maritza. When her youngest daughter started high school (my mother was in college in another city), grandma decided to start a whole new journey. She wanted to feel a purpose in her life and she wanted to feel accomplished. 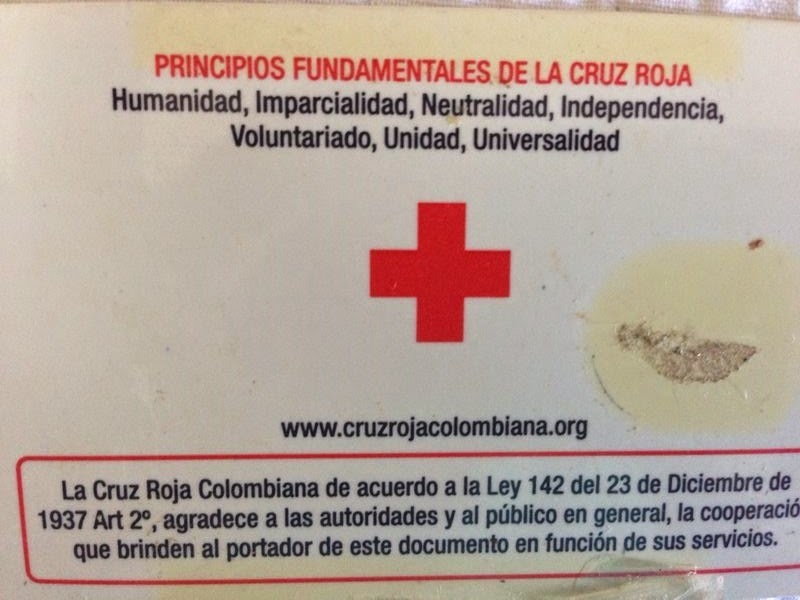 She separated from my grandpa and, in 1974, she joined the Colombian Red Cross. Deeply passionate about helping others, grandma started volunteering as a dama gris or gray lady, providing nursing services across marginalized areas around the country. My grandma’s eyes brighten every time she tells the stories of her 35 years as a volunteer, travelling and meeting others while she provided hope and health services to those in need, wearing a gray dress. She told me how she traveled to remote areas to provide free vaccinations to children, how she talked to women with health issues, and how she gave talks about reproductive health. She recently told me about travelling with the Red Cross to provide farmers with food and healthcare after a flood in the small villages that border the Magdalena River. Based on what I learned about my grandmother’s Red Cross work, I believe that the values of deep neutrality and humanity that characterize the Red Cross allow the organization to impact every person involved in it. It is an organization that promotes and provides aid, irrespective of nationality or any religious or cultural affiliation, which makes it, for me, the most peaceful, inclusive organization in the world. My grandmother’s Red Cross experience also inspired her to study nursing, after completing her high school studies. In 2001, at age 56, she pursued a nursing degree, while living with my family in Cartagena, the northern Colombian city where I was born. She later worked for a hospital, while still volunteering for the Colombian Red Cross. It is almost magical, how the story of my grandma connects with mine and how everything she went through and every tear she shed, led me to where I am today. She always taught her daughters—and me—to be independent; to complete our studies so we could excel in life and be autonomous. That is why my mother, who is the regional CEO of a bank which helps the Colombian petroleum company (Ecopetrol) workers, taught me and my sister those values and was, as well, inspired by my grandma to strive, succeed and help others. Thanks to the legacy of my grandmother, who currently lives with my mom and dad in Cartagena (I see her every time I visit), I am passionate about serving others. I am currently studying in the United States, about to attain my bachelor’s degree in communications, and I am interning in the Communications Department of the Greater New York Red Cross, where I write for the chapter's blog and post on their social media. I get to inspire and help others on behalf of one of the most important humanitarian organizations in the world! I have also volunteered and interned at several other nonprofits, including Operation Smile, UNICEF and DoSomething.org. I hope other grandmas and granddaughters keep getting inspired to love, thrive, help and succeed, just as my grandma and I did.